Migraines are a very misunderstood condition to begin with, so if a person has never experienced one themselves, it may be tough to know what to say or how to help a loved one or even a coworker. We’re going to look at a few things that everyone should know about migraines so that we can be understanding when a person is coping with them. We will also discuss a natural therapy that has helped dozens of patients in case studies to overcome this debilitating condition for good. The first thing you need to understand about migraines is that they are not just bad headaches. This a neurological condition and there are many other symptoms besides the head pain. For example, sensory sensitivities are among the most common symptoms. That means a person may be sensitive to bright lights, strong smells, and loud or repetitive noises. Other symptoms may include nausea and vomiting, neck pain or stiffness, changes in vision, vertigo, diminished cognitive function, depression, anxiety, and more. For a person with chronic migraines, he or she has at least 15 headache days per month. However, it is also possible to have migraines on a daily basis. One thing that can make migraines affect a person on a daily basis is if he or she experiences more than just the headache phase. There are actually up to four migraine phases, with the prodrome beginning as much as a day before the headache and the postdrome lasting up to 48 hours afterward. In these cases, a person may only have one to two migraines per week but be unable to carry out regular daily activities just about every day. Only about 20-25% of migraineurs experience aura. These are additional symptoms that occur within about an hour of the headache phase. They can include numbness and tingling sensations, temporary vision loss, or other visual symptoms like seeing flashing lights or zig-zag lines. If a person experiences migraine with aura, he or she is at greater risk of depression as well as suicide. Therefore, it is important to keep an eye on the mood of the patient (which may also fluctuate thanks to the migraines). For some migraineurs, medication may be needed to deal with the depression that comes along with migraines. For others, an understanding friend to talk to may be enough. Help your loved one to gauge how serious the depression is and discuss any thoughts of suicide with a doctor. According to the Migraine Research Foundation, about 90% of migraineurs cannot carry out normal tasks during an attack. In fact, many people have lost jobs over lack of performance and missed work days. The World Health Organization (WHO) ranks migraines among the top 20 most debilitating conditions in the world. It is listed alongside things like terminal cancer, depression, and back pain. Your loved one may be taking medication every day, but that doesn’t mean all of the migraines will stop. Most medicines are not designed for migraine use. Doctors either use them to treat migraine symptoms or to try and reduce how often migraines occur. Either way, there are varying degrees of success from patient to patient with these drugs. Often, the side effects are worse than the benefits which can lead to even greater frustration. Sometimes the medications are actually meant for seizure patients but are given to migraineurs because the two conditions are both neurological in nature. Finally, some migraine sufferers overmedicate with over-the-counter pain relievers. These pills can actually cause rebound headaches if taken too often, so this is something else to watch out for. Fatigue is common for chronic migraine sufferers. It can happen in both the postdrome and prodrome phases, leaving the patient feeling worn out on most days. This is not laziness. It is a symptom of the disease. The stress of not accomplishing as much as he or she wants to during the day may increase stress and make matters worse since stress worsens fatigue and is a known migraine trigger. Try to find enjoyable things to do that your loved one has enough energy for. This may reduce stress and help improve quality of life. As with any natural therapy, results will vary from person to person. However, research is exciting when it comes to the positive effects of upper cervical chiropractic care for migraine patients. 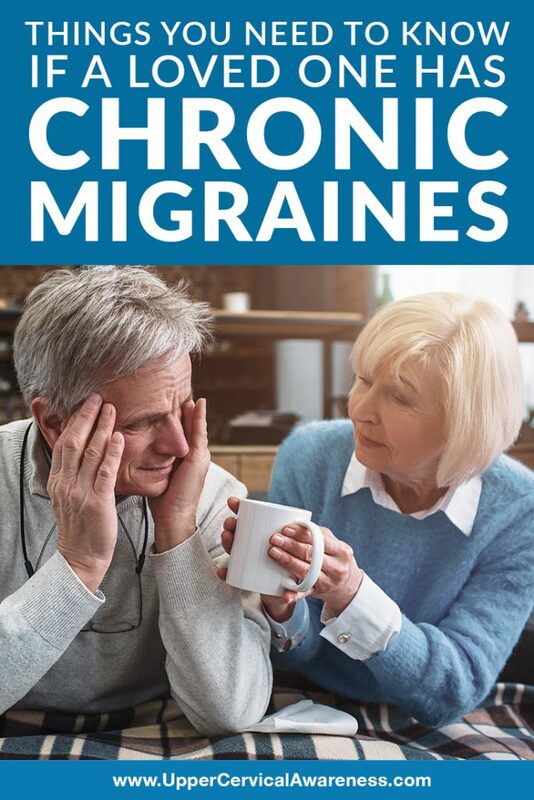 In some case studies, individuals went from having chronic migraines to being completely migraine-free! Others saw a significant reduction in how frequent and severe the attacks were. It certainly makes this subspecialty of chiropractic worth a try for anyone who is dealing with such a debilitating problem. When the upper cervical spine is out of alignment, it can affect brainstem function as well as the proper flow of cerebrospinal fluid and blood. The misalignment doesn’t have to be extreme, so while past head or neck trauma is a good indicator that a misalignment exists, this can also be the underlying issue for someone who simply has a misalignment due to normal wear and tear or poor posture. To learn more, schedule a consultation with a practitioner near you. This may be the safe and gentle way to break free from the shackles of migraines once and for all.